What’s under the lid of the tactical Rapid Field Deployment System? Barrett Communications’ Rapid Field Deployment System (RFDS) is the ultimate all-in-one solution for tactical operators who need a range of communications options to-hand in the field. Compact, reliable and flexible, the VHF PRC-2080 RFDS and the HF PRC-2090 RFDS both offer the peak performance available in radio communications. 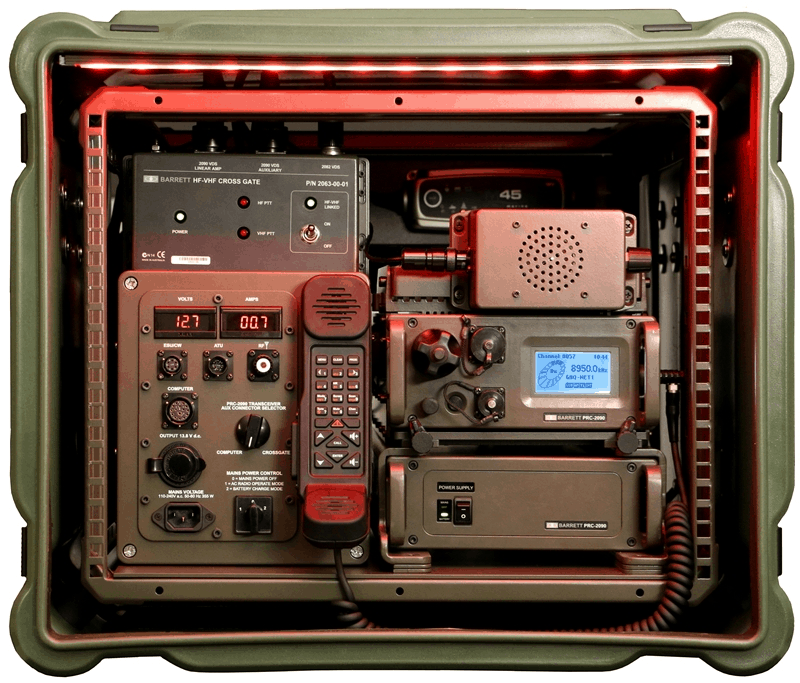 But what makes these tactical radio systems the best option for field operators in need? Let’s take a look under the lid of the Rapid Field Deployment System and see what technical specifications set it apart from other radio equipment. Both the VHF PRC-2080 and HF PRC-2090 RFDS offer numerous battery charge options for your transceiver equipment. This choice is key, especially in field situations where tactical communications are essential and power supply options are limited. • AC mains power supply connection. Simply hook the radio equipment up to mains power and you will be able to use the VHF PRC-2080 and HF PRC-2090 for however long and for whatever application you need. • Onboard rear mounted 33 Amp-Hour sealed battery, with interchangeable external battery options. • The Power Management Unit (PMU) is the control centre of power in the RFDS units. It automatically monitors and selects input power from the available options, prioritising the quickest and most reliable charge. An internal 7 Amp battery charger keeps the onboard battery ready for use while AC mains power is available, and a secondary charging source is available via solar power input. Radio operators are kept informed about all powering options through an LCD display, offering real-time reports on voltage, current and power source data. The RFDS devices also boast an external USB accessory socket to charge tablet or smart devices. Numerous power supply options are useless unless radio equipment offers top-of-the-line functionality first and foremost. Our VHF RDFS unit boasts a 50 Watt low-band tactical transceiver, enabling operators to communicate over line-of-sight – ideal for keeping in contact with other field locations on tactical missions. • The HF RFDS operates between 1.6-30 MHz, ideal for seamless communications, and offers 125 Watt peak envelope power for more powerful transmission. • Barrett’s HF PRC-2090 also boasts optional 2023 internal HF Modem for email, fax and data transmission. Adaptable HF radio systems are a vital tool available to radio operators in the field, which is why the HF PRC-2090 RFDS is also equipped with the Barrett 2063 crossgate. This allows for interoperability between the HF and VHF transceivers. • Both the VHF PRC-2080 and HF PRC-2090 Rapid Field Deployment Systems are encased in ruggedized, anti-shock and vibration shells designed to meet worldwide military standards. • The RFDS line is supplied with transportable base station unit. This means the all-in-one radio communications equipment is both field and vehicle deployable, enabling it to be used for any tactical application. • We also offer remote control tactical LED lighting for ease of use during night operations. Most importantly, all Barrett VHF PRC-2080 and HF PRC-2090 RFDS units are field deployable within minutes, making them the ultimate in flexible communications options. For more information about our tactical radio communications equipment, contact the team today.